In January, as part of DC's Blackest Night event, 8 classic titles rise from the grave for one more issue. However over a dozen books can be a bit of a hard ask for any New Years comic budget, so to help you decide which to grab, here's the wrap on the first in a 1-0-1 series; Suicide Squad #67. WHY YOU SHOULD CARE: Forget The Dark Knight Returns, Suicide Squad helped define great 'grim and gritty' comics, without the pull of a major icon. A bunch of crims offered absolution by the government in return for numerous 'suicide runs', squad members who died on the job got out easy - saved from having to put up with 'immovable' operation chief Amanda 'The Wall' Waller. 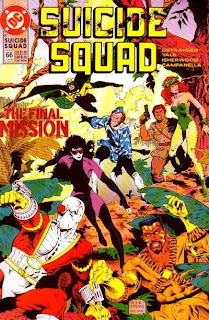 The man who made the Squad a cult-hit, John Ostrander, returns alongside Gail Simone to script Suicide Squad #67. Stuck between a 'Black Lantern' Fiddler, hungry for the hearts of old friends, and his old gang; the Suicide Squad, Deadshot has only his current crew, Gail's own current hit bunch of renegades; the Secret Six, to help him survive! 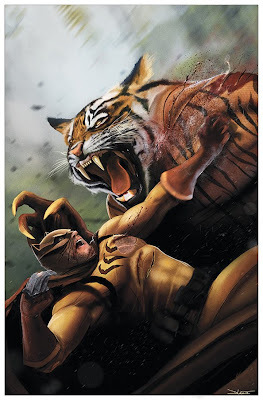 Even with The Wall stepping in to set things straight, this J. Calafiore penned issue is so so big it hijacks the pages of Secret Six #17 to fit the action - plus just check out The Bronze Tiger on that cover! hey look what i found like a friggin year after the fact! too bad i didn't know about IADW back then. Let that be a lesson to the world! Hunt out the issue if you can Dave it's a great one!